This is the first of our iMindMap 10 feature reveals. We know that iMindMap fans are going to love the next evolution of the software. We will be releasing sneak previews of the new features in iMindMap 10 in the build up to launch. Keep checking your inbox to be one of the first to discover the secrets of 10.
iMindMap 10’s new Branch Drawing Tool makes your Mind Mapping experience more natural than ever before. The intuitive movement of the drawing tool helps you to work quicker. You’ll find all your favourite editing tools conveniently situated at the end of each branch, where they are needed the most. This fluid way of working won’t interrupt your flow of thought so your ideas can radiate from branch to branch without restriction. We have refined the most fundamental element of the Mind Map View. Simplified, yet more powerful than ever. Our improved Branch Drawing Tool is perfect for desktops or touchscreens. This organic way of working feels effortless, leaving more time for big thinking. The new branch edit menu button packs a massive punch. Click it to open an all-new Pop-up Edit Menu that is home to your favourite editing and customisation tools. With these options at your fingertips, you can save yourself time spent looking for editing tools, which means all you need to find are the ideas. The menu remains hidden until you want it, keeping your workspace free of clutter. The Pop-up Edit Menu allows you to expand and collapse branches, draw relationship arrows, add boundaries to group your branches, easily access your sketch tool, edit your branch type and much more, accelerating your Mind Map creations. 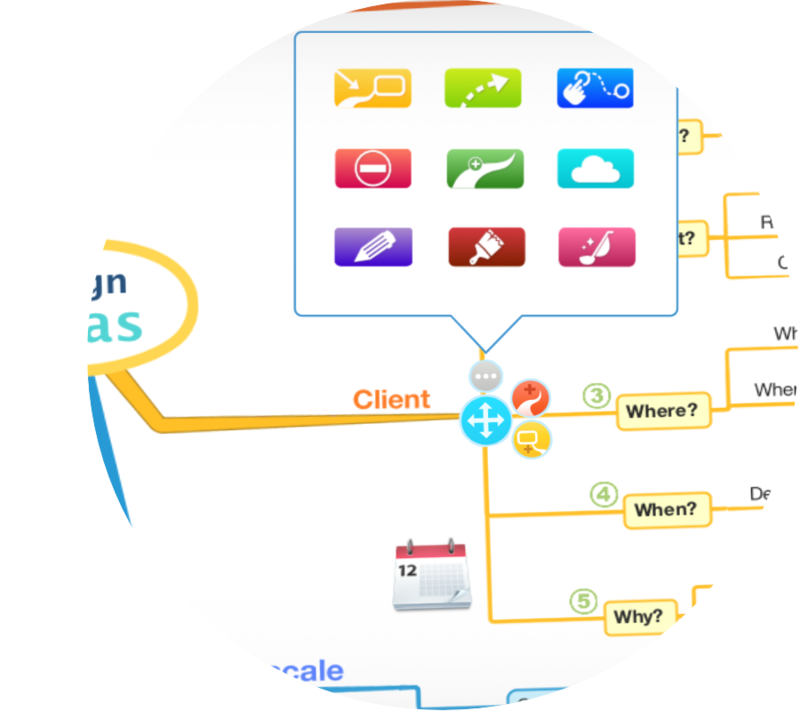 As always you can personalise your Mind Maps by formatting your branch designs and colours, creating a Mind Map that’s unique to you. We can’t wait for you to experience our most authentic drawing style to date. Along with convenient placements of tools and buttons, iMindMap 10’s enhanced Branch Drawing Tool will save you time and energy in a workspace that encourages big ideas and forward thinking. Stay tuned for more feature reveals coming soon.